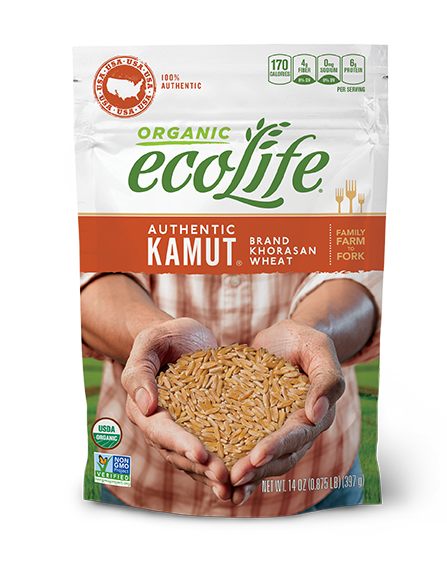 ecoLife® KAMUT® Brand Khorasan Wheat is an ancient relative of modern wheat. Unchanged and unhybridized for thousands of years, today KAMUT® is organically grown by family farmers in Montana who are dedicated to preserving the purity of this most unique grain. KAMUT® wheat is hailed as “the high energy wheat,” and with good reason: each serving boasts high levels of the protein, lipids, and essential amino acids needed to maintain a busy, active lifestyle. 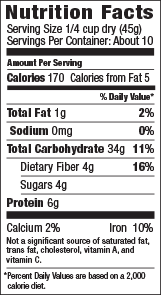 What’s more, KAMUT® wheat is an excellent source of fiber, zinc, magnesium and selenium, a mineral known as a strong antioxidant. Bring 3 cups of water to boil, then add 1 cup of kamut. Reduce heat to low and cover. Simmer 30-40 minutes or until tender. Allow 45-60 minutes if unsoaked.